Staying mare Sedanzer bounced back into the winner’s stall with a dominant display to take out the Group 2 $300,000 Pages Hire Brisbane Cup (2200m) at Doomben today. Sedanzer, scored a comfortable win in the 2018 Brisbane Cup at Doomben. Photo by Steve Hart. Winning jockey Tim Clark was able to give Sedanzer ($2.80 favourite) a sweet run just off the speed and once he eased her into the clear at the top of the straight, the Sebring mare scooted away to record a comfortable two and a quarter lengths win to the cheers of the punters. The Stephen Lee trained Anton En Avant ($20) ran up to his last start Doomben win to fill second position while Kiwia ($5) ran another honest race for third. 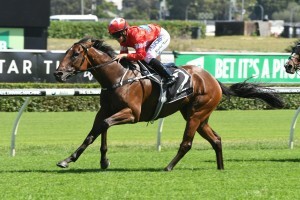 Sedanzer was lining up for her fourth run this campaign and Clark knew that the Gai Waterhouse and Adrian Bott trained mare would be rock solid in condition after coming off a last start third from a wide barrier in the Group 3 $125,000 Channel Seven Premier’s Cup (2200m) at Doomben a fortnight ago. “The barrier’s made a big difference,” Clark said. Sedanzer has now made it two wins from four starts this campaign following her win two starts back in the Listed $200,000 Scone Cup (1600m) at Scone on May 11. The Anthony Freedman trained Ambitious ($5) was caught wide for most of the trip and battled on in the straight to fill fourth spot.